Interests:Mountain biking, hiking, skiing and rugby! We have managed to get extra time off work and are planning (isn’t planning a trip half the fun? ), a 7 week trip through Southern Germany, Austria, Slovenia and Croatia. We intend to visit the Heidelberg area before moving to a little Austrian village called Lofer, not far from Salzburg and then onto Slovenia before Croatia. We hope to go to Lake Bled but can find very few campsites in the area-can anyone offer any advice on sites, the area, or other places to visit in Slovenia? This has been a destination I have wanted to visit for a long time as I have such heard great things about it! Others may have better experience of Slovenia but mine is limited to a day trip to Lake Bled from a site near Ossiach in Austria where we were staying at the time (sadly now closed). Because we were only going for the day, we avoided the expensive tunnel and motorway tolls by going over the Wurzen Pass without the caravan but it was a fairly easy road as I remember - we followed a lorry over. The lake is certainly well worth a visit and there is a good campsite right on the lake called Camping Bled which is an ACSI site if you're going out of season. We went to Croatia and Slovenia in April/May this year. There is an ACSI site at Lake Bled and this was our favourite site in Slovenia - the scenery takes your breath away. If you fancy exploring the capital, would recommend a trip to Ljubljana, which is 35 miles away, a really nice small city centre with parking in the centre. We also stayed at Camping Adria at Ankaran. The site is convenient for visiting Trieste, 8 miles away. It was a busy site with many long term pitches which seem to have extensions fitted to cover the whole pitch. We managed to get a pitch on the water front, but this is across from the industrial port, which can be noisy. It was ok for a couple of nights, but won't appear in our top 10. We keep hearing how beautiful the scenery is! Interests:Fly fishing, Ornithology and wildlife generally. Camping Bled is on the edge of Lake Bled, literally. We found the site clean and well run with two service blocks. The staff were friendly and informative. There is a restaurant on site as well as a supermarket. There are areas on the site where levelling blocks are required, but at the bottom of the site near reception it is relatively flat. We enjoyed our stay there and would happily return to Camping Bled. Thanks for the Info Clubman. About four years ago we stayed at the campsite on the outskirts of Ljubljana itself called Ljjubljana Resort. Make sure you visit the Postjona caves and if interested in horses the Lippizaner stud at Lipica. A beautiful country. For Heidelberg recommend the site Friedenbrucke on the banks of the river in Neckargemunde. The ferry to Heidelburg stops here and is a pleasant one hour sail down to Heidelburg. Pitch on the river bank is extra but worth ih. Thanks Benfica, Postjona Caves now added to the list and the Friedenbrucke is the site we have chosen for Heidelberg, good to see it recommended again! We were heading to Slovenia and Croatia this summer but my wife's poor health limited our distance. We did visit Salzburg - stayed at Camping Schloss Aigen, and Innsbruck - Camping Innsbruck. We liked both sites and would go back to them, not all singing and all dancing but quite peaceful and well situated. Camping Innsbruck doesnt advertise them but has fully serviced pitches. Thanks Bubble, sorry to hear your trip didn’t work out, I hope your wife’s health has improved! We have spotted a lovely looking site in a little ski village called Lofer which is an easy day trip to Salzburg but we may stop near Innsbruck on our return journey! If the site at Lofer is Camping Grubhof, its excellent & yes, its perfect for Salzburg for a day. Great bike paths everywhere & extremely scenic. Agree also with Camping Bled - it was quite wet when we were there but the site is sloping, so the pitches higher up near the top toilet block were better. We also stayed on a very small site not far from Skocjan caves which was lovely (near Lippizaner horse stables at Lipiza & the mercury mine at Idrija, plus one in the west called Lijak Active near Nova Gorica - handy for visiting the Soca Valley & WW1 stuff. We've done several tours of Austria/Croatia/Slovenia/Black Forest - have a look at my blog below, sections called Grand Tour of Europe, Unicorn to Slovenia & Adventure to Croatia, or ask anything you want to know about. We have stayed at the Lake Bled site three times now and never disappointed. Toilet blocks are clean, restaurant is excellent and good value, the walks round the lake to the town at the far end are so scenic. Nice boat trip to the church on the island. There is a lovely scenic drive up the valley to Lake Bohinski with pretty villages en route plus lots of forest and mountain views. We have also stayed at the Ljubljana Resort site which is good, with a bus service outside to take you into the city, which is a must see. If you go on to Zagreb, then Camp Zagreb on the outskirts is a modern eco friendly and very smart site. From there towards the Croatian coast I can highly recommend Camping Slapic, Duga Resa, just past Karlovac. We stopped there overnight a few years ago and ended up staying ten days . A lovely site on the river bank with river swimming in crystal clear waters, lovely cheap cafe restaurant, excellent facilities and very friendly. Thanks Blackpool Belle, Camping Grubhof is in deed the site we have chosen in Lofer, great to hear some firsthand experience and I will be reading your blogs (and no doubt asking more questions!). Thanks to you too Not So Big John, I’ll be investigating some of the sites you mention and might be asking you some more questions as well, we still haven’t nailed down our plan for Croatia as yet! Camping Grubhof is just about our favourite site in Austria In Croatia we can recommend Camp Borje, in the national Park close to Plitvice Lakes (wonderful place with walking trails & literally dozens of waterfalls). Spacious, nice facs, good restaurant & a free shuttle to the lakes once a day. On the coast we loved Camping Oaza Mira at Duga Resa - right on the beach in a sheltered little bay & many pitches have views of the turquoise sea. 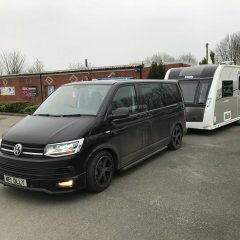 Brand new facs, lovely pool & restaurant & helpful reception, huge hardstanding shady pitches (we have a big caravan & even with the awning out we could have got 2 more cars on it!). Absolutely lovely but a bit more of a challenge for motorhomers as the only supermarket is a good 10 min slog uphill & there are no buses. Both sites are ACSI & are €19 + taxes out of season. Snap. We visited this area when it was still Yugoslavia, and for the life of me, can't remember the name of the site we stayed on. I do know that it was close to Lake Bled as we had an inflatable boat which we used (if you have a boat, don't bother bringing an engine, you can't use them on the lake), and we went a few times. Also visited Ljubljana. When leaving Austria to enter Slovenia, I remember taking a wrong turn and went via Villach and over the tops (hairpin bends you wouldn't believe). You do get brilliant scenery going over the Alps (but with a nerve racking drop over the edge on one side and a cliff wall on the other, I wouldn't do that part again), but would recommend, if towing a caravan, going via Trieste. Once we get a few more plans made I may be asking some more questions! Its not the only one, we use Camping Sobec at Lesce just off the Bled motorway exit . Very large resort type site much nicer than camping Bled but more expensive. We went to Slovenia in May 2016 via several days in Austria using ACSI card sites. It was a very simple journey from Villach through the Karawanken tunnel (Toll €7) to Camping Bled . We stopped at a service station en-route for the rapid process of buying a Vignette for Slovenia - price varies with days required. We had been through a similar process just before entering Austria. We pitched in the upper part of CAmping Bled as we found the lower part damp and a bit claustrophobic with trees whereas the upper pitches were out in the open, large and level. The bread man comes up to them every morning. We walked from the van around the Lake which was a pleasant way to see the town and also enjoy the scenery - about 4 miles on good footpaths. We visited an fascinating Bee museum which even had live exhibits flying in and out in a plastic tunnel in the small town of Radovlyica and a small iron industry museum in Kropia. Another day saw us drive the short distance to Lake Bohinj and visit the Dairy museum at Stara Muzina. We also enjoyed a scenic rail journey through the hills from Bled Jezero rail station, close to the campsite, to Nova Goriza on the Italian border. There was time for a superb pizza lunch before catching the train back. The Vintgar gorge is well worth visiting for a 1 mile walk along a gorge on a wooden walkway. We moved on to Ljubljana Resort campsite just to the North of the city. A bus passes the site and takes you into the centre which was an enjoyable visit. On to the small length of coast at Camping Adria near Koper. A busy large site as we were there over the weekend but became much quieter on the Monday. A real mix of a huge industrial port complex and then old fishing villages which were very touristy. Our next site was Camping Menina, near Mozirje in Central Slovenia: lovely site and a great welcome from the English speaking owners. This was a beautiful, scenic mountain area with very few tourists, Robanov Kot is supposedly one of the most beautiful valleys in Europe where we walked up and back and the Solcava panoramic drive along the crest of a line of hills is a spectacular circular route which descended back down to let us visit the Rimka waterfall. We also visited a forestry museum near the campsite, a leather museum in Sostanj and on to Valenj for a mining museum where you can go down the mine - only school groups on the day we were there but Valenj has the biggest statue of Tito in the world. We moved the short distance to Camping Terme at Ptuj for one night to visit this very pretty, olde worlde, town. Camping Terme is opposite a hotel and we had the unusual experience of checking in to a campsite at the front desk of a 4* hotel as the campsite reception is only manned in high season. As well as wandering around the old town, we drove to visit the Ethnographic Outdoo Museum at Rogatec: a very good example that you walked from house to house or barn to mill to see what life in rural Slovenia had been. We were glad that we made the effort to drive there. I turned up at Camping Bled for an overnight on my way to Croatia in June last year without a booking and found it to be full. I had passed Camping Sobec on the way so decided to stay there. A bit pricey for a pitch but there was loads of room and the restaurant served a decent meal. That’s great info folks, especially the info regarding inland Slovenia Burstneraddict! We’d be very interested in this area, thanks! We too would second Burstneraddict's comments on inland Slovenia - we loved the coast in Croatia & have stayed at Camping Bled, but would return to the rural areas of Slovenia in a heartbeat. This year we stayed on a very small site, more or less in someone's garden, but with great facilities, lovely views & great owners - who greeted us with a carafe of home-made wine & 2 glasses! We visited places that wouldn't appear in a guide book, took part in the village parade for Pentecost & went to the local fire brigade's party. We will be back.